Ever since I got my leopard print phone case, I knew I wanted to jazz it up a little more. 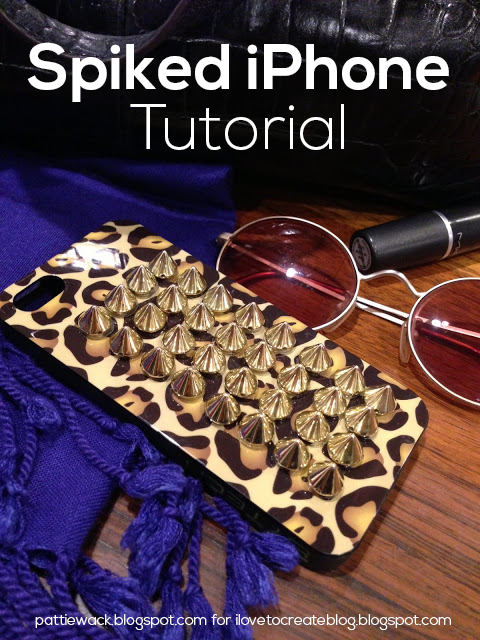 So when we got a delivery of studs in the iLoveToCreate design studio, I knew they would be the perfect accent for my phone! I also was excited to get to use the new Aleene's Jewelry and Metal Glue Tabs for a project! They are so easy to use and I was able to make this project in about ten minutes! Next, I used a clear ruler to line up the adhesive dots and stuck them to my animal print cover in rows. You'll be able to cover the whole thing, or do like I did with four rows of eight, in the center of the phone. The 1/4" dots fit the bottom of the studs perfectly! I used tweezers to peel off the red backing from the Aleene's Jewelry & Metal Adhesive Dots. Then I sat the studs right on top of the dots. You have to be pretty precise, because these boogers really hold fast. and it's tough to pull them off and realign. Just be patient and take your time. I didn't have to wait for it to dry, since the adhesive is instant! I hope you like my studly bling. It added a lot of pizazz to my phone, and makes it totally different than anybody else. Easy-peasy. Cute, but how do you hold your phone now? Looks great. Because the glue spot has some thickness to it, will the edge of the dot be tacky? I' m thinking, will longer hair get trapped/wrapped around stud because of glue. Beautiful iPhone cases using jewelry metal. Interesting sharing. Wow!! Thats a fantastic idea. Thanks for sharing with us,and kindly give more updates on such interesting ideas. it totally different than anybody else but we have to put all of the accessories our self and than carefully move it. Mix colors is my favorite. I know that all king of people also attractive for various colors. CNC Machine Bangle Sample offered by us is of finest quality and offered to the esteemed clients at the market leading prices. Offered samples are manufactured by taking assistance from CNC machine. Apart from this, supported by the aid of our professionals, we have been able to establish ourselves among the leading names of the domain. Lovely case - leopard digital print is amazing. That mobile cover looks great! Enjoy the lowest prices and best collection of iPhone case covers ever only at Kase because style is what matters with iPhone covers quality.